The video below explains the features of Merit Campus, please watch it to know more about us. Text Transcript of the above video. Hello and welcome to Merit Campus . 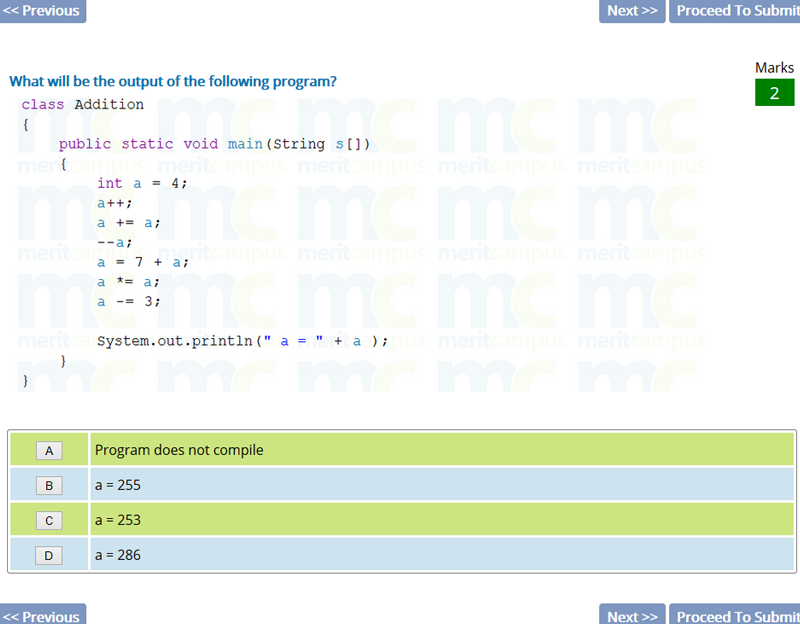 Merit Campus is a website which helps in learning and improving your programming skills using the Java programming language. 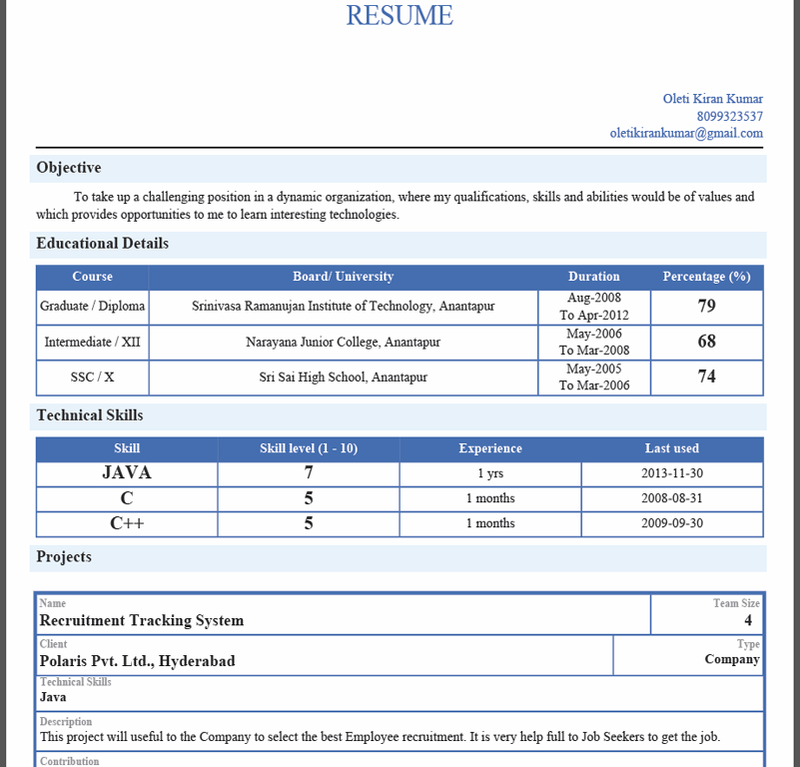 We are a group of programmers who developed this site and our goal is to identify students with good application skills and help them to excel at programming. Irrespective of their English, we want them to get noticed and to get utilized either by doing a job or starting up on their own. To achieve this goal, we have included various online tutorials, videos and quizzes. In our tutorials section, we have lots of basic core java topics like data types, operators, control statements, arrays, classes, method overloading, abstract classes, interfaces, packages and exceptions. More topics like collections, strings and threads will be added in future. Every topic is written in simple English so that any basic user can easily understand it. They are also accompanied by a video which explains the topic in detail. The video can be directly watched on the page or can be downloaded and watched. A sample topic is here . Currently the videos are in Telugu, but in future we will add English version as well. Every topic has links for navigating to the previous or next topics or any other related topics. Every topic also shows a list of related questions at the bottom of the page. Using the search box on the top of every page, you can easily search any required topics. Most of the topics are explained using examples. A sample topic with example is here . Every example has code, output, description and things to try sections. In things to try section there are suggestions for code changes that can be practiced. These 'things to try' can either be practiced using our online 'Try It' editor or can be downloaded and practiced on your local machine. Using your online Try It editor , you can make changes to the code and use the compile button to compile and run and see the output of the program. 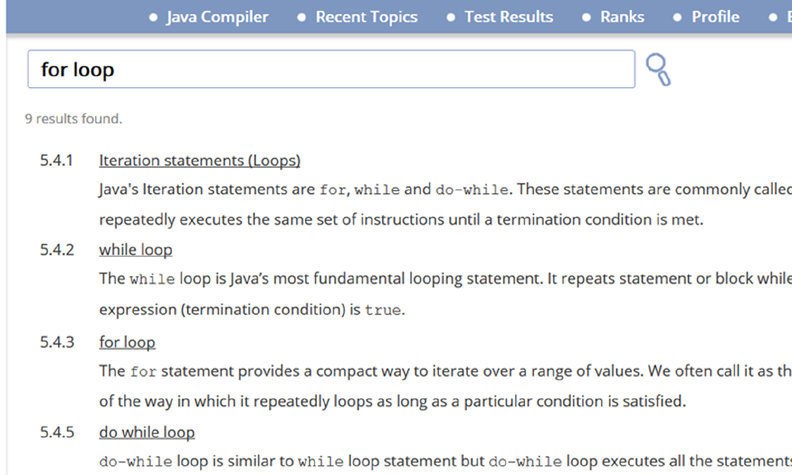 The online compiler also shows the compilation errors and the runtime errors. 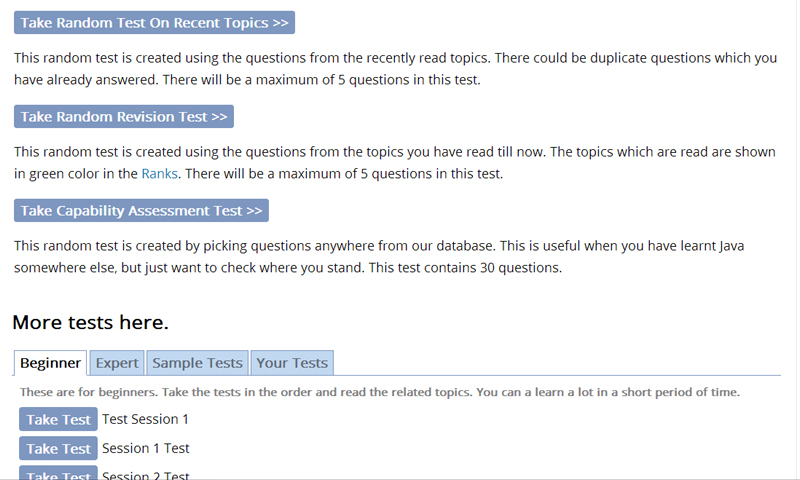 If you are registered user, you can go to the Practice Tests Tab and use the 'Take Random Test On Recent Topics' link to create a random test from the topics you have recently read. 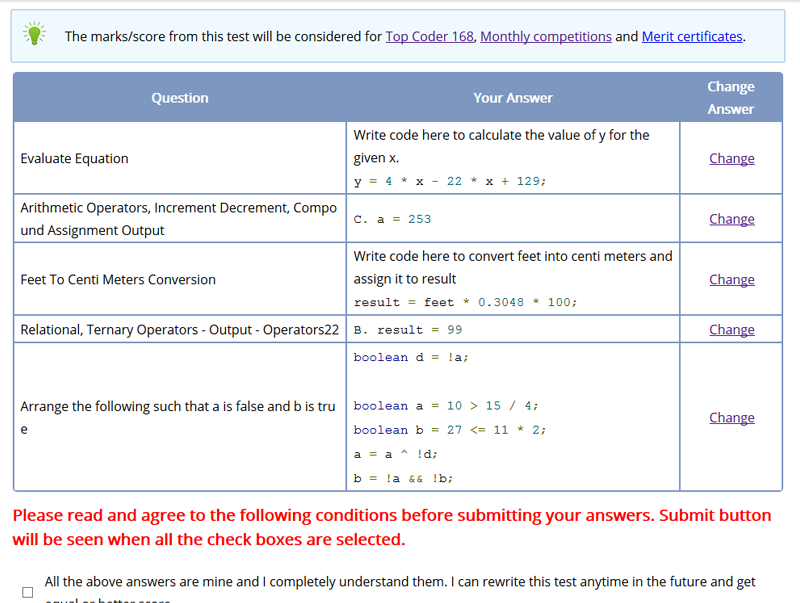 It will create a random test containing multiple choice questions, order questions and programming questions. Multiple choice questions can be answered by clicking on the correct choice, where as for the order questions you need to change the order as required and click on the answer button. 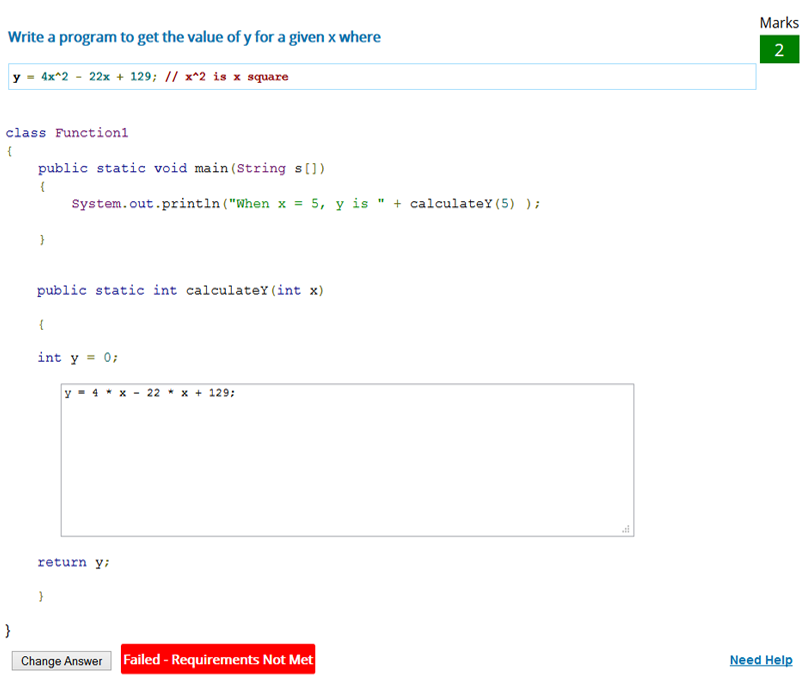 The most complex and interesting questions on our site are the programming questions. For the programming questions you have to write code to make various test cases pass. This is where your programming skills are put to real test. 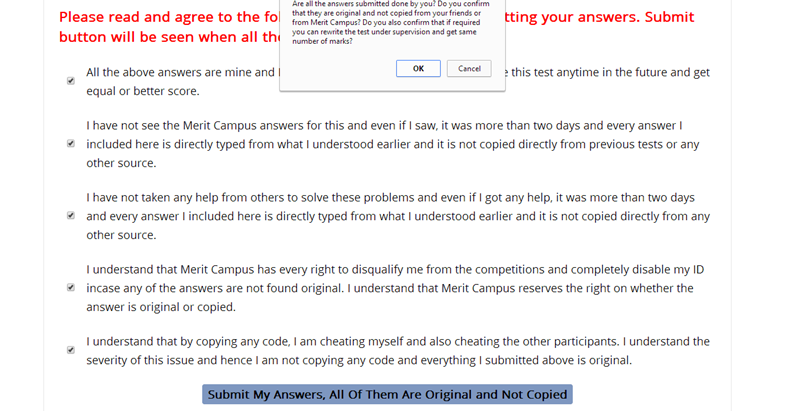 Once you have answered all the questions on the test, you can proceed to submit, where you can review the answers once more before finally submitting them. As soon as you submit, the results will be displayed, showing what is correct and what is wrong. 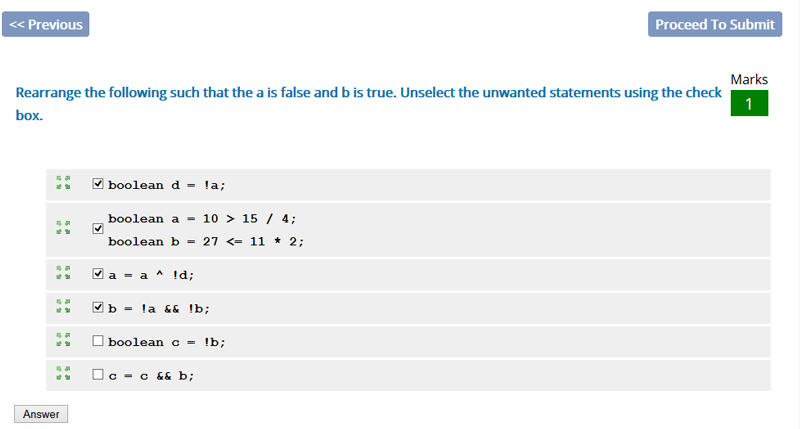 In case you go wrong, it also shows the correct answers. Some of the questions have explanations as well. In the quizzes tab, you can also use 'Take Random Revision Test' to take a random test in all the topics you have read today or before. If you have already learnt java somewhere else and you don't want to read the topics, then you can 'Take Capability Assesment Test' which will give you questions from anywhere in our database. This is a good test to see how much you have learnt and how you can effectively use that knowledge to write the programs. 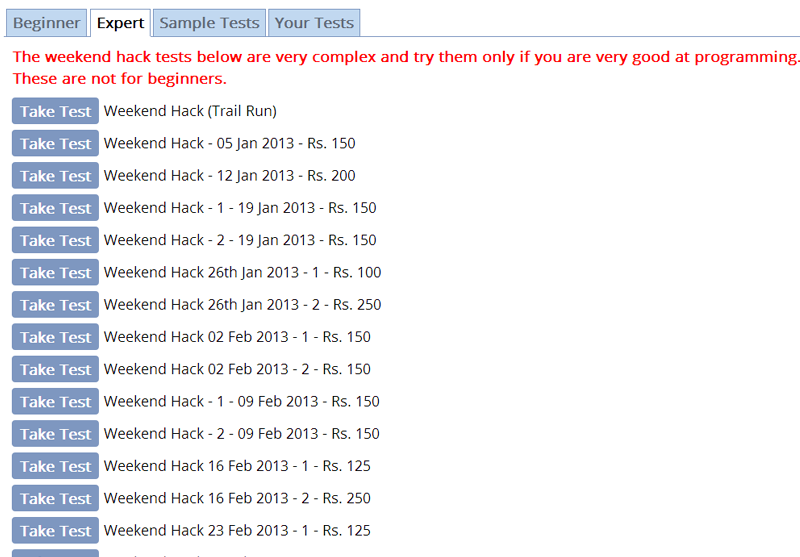 There are also few other sample tests and weekend hacks in the quizzes tab. The weekend questions and results can be seen here . They show only a subset of complex programs like finding horse path in chess, longest chain of ones, finding family relations, type of shapes, character combinations etc. 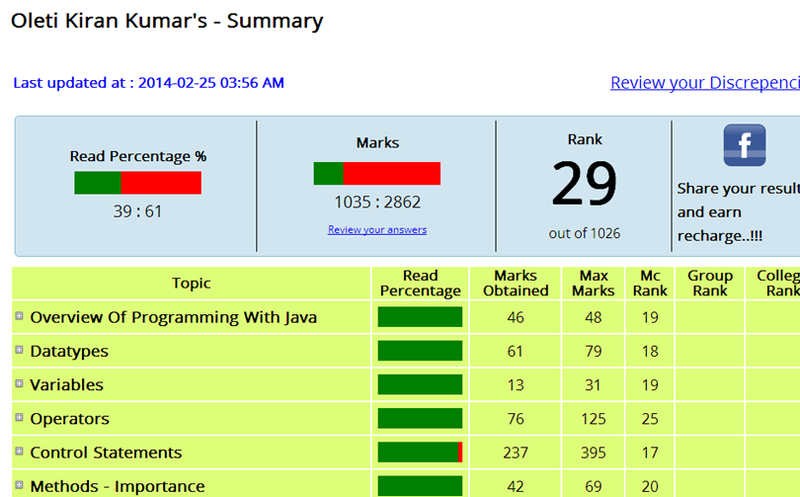 Every quiz or test you have written on our site will be tracked and they are included in 'My Results' tab. 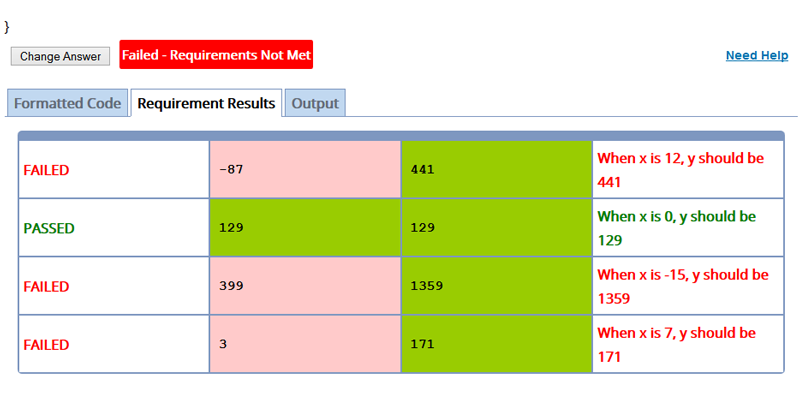 This tab shows which tests are pending, what tests you have completed, how many marks you got for each test. 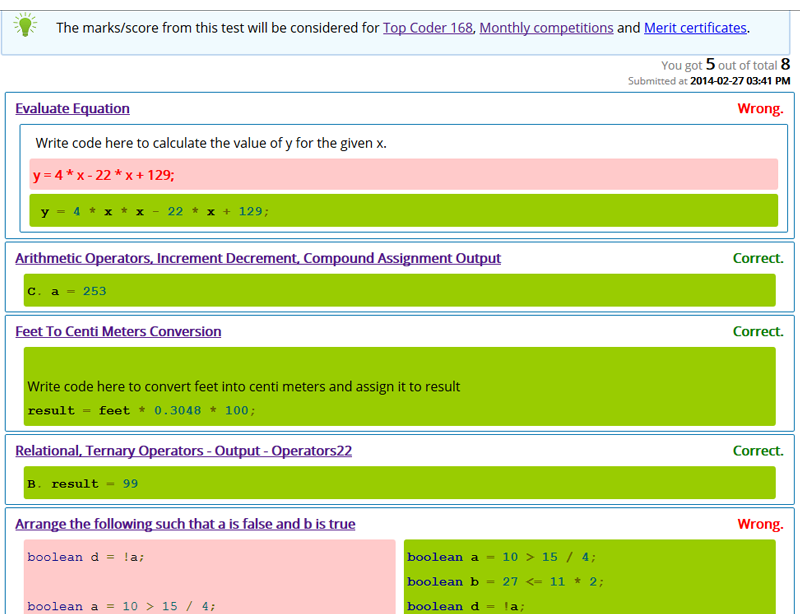 If you want to see the total marks you scored and compare your status with your peers, you can go to the 'Ranks' tab. This tab shows all the topics on our site, what you have read, how many marks you scored for each topic and what is your rank compared to other users of the site. If not already registered, you can register at our site by giving your details. With this registration you can also participate in various competitions like Top Coder 168 or the Programming Competitions . Yes, there are prizes like mobiles, cash prizes, mobile recharges and certificates, but they are very less compared to the learning and the confidence you get by writing various tests. Looking forward towards your active participation and hope you have a fulfilling and enjoyable journey with us.